If you are considering hiring an attorney to represent you in your divorce your first experience with that attorney will likely be a face-to-face consultation. A divorce consultation can cause anxiety for those going through their first divorce because they do not know what to expect with respect to the dissolution process and the consultation itself. Consulting with an attorney about divorce is likely the first meeting with a lawyer that most parties experience. Many misconceptions about attorneys, law firms, and the legal field in general are perpetrated in film and on television each day. These portrayals can confuse potential clients and create apprehension about their first meeting with an attorney. Your first consultation at Bickford Blado & Botros will be professional yet relaxed. However, in order to get the most out of the time you spend with an attorney during the initial consultation it is important to come prepared. Before your first meeting regarding your divorce matter you will want to gather as much information as you can regarding your family’s assets, debts, and overall finances. The more information the client provides his or her divorce attorney the more specific advice the attorney can provide the client. Often times at the outset of a divorce, one spouse has little to no information regarding the other spouse’s income. If a potential client provides the attorney with a recent tax return and/or current paystubs, the attorney can give the client more information regarding possible child support and spousal support scenarios. Potential clients should beware of family law attorneys who provide free consultations but offer little specialized or specific advice during that time. Many free consultations consist of an explanation of the process but do not go much deeper into the client’s particular case. If a law firm charges an hourly rate for a consultation, the client will likely receive much more useful advice. For example, at Bickford Blado & Botros, if applicable, the family law attorney may run actual numbers to approximate child and/or spousal support if the client is able to provide appropriate financial information. Further, the attorney may take a look at important title documents and deeds in order to give the potential client an idea of how specific items of real and personal property would likely be divided by the court. During the initial consultation attorneys at Bickford Blado & Botros are willing to work with the client to create an overall strategy for the case. This can give the client peace of mind because he or she will be more informed about how his or her case will proceed through the dissolution process. Please contact us if you are considering a divorce from your spouse, a legal separation, or have questions regarding child custody and visitation. 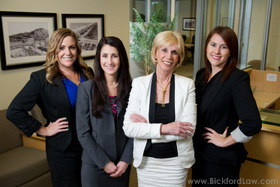 Nancy J. Bickford is the only attorney in San Diego County representing clients in divorces, who is a Certified Family Law Specialist (CFLS) and who is actively licensed as a Certified Public Accountant (CPA). Don't settle for less when determining your rights. Call 858-793-8884 in for more information about the consultation process.